Ahead of CES 2013 next week running from Jan 8th-11th, Archos has unveiled their new Archos TV Connect device, which has been designed to transform your HDTV into a Android Smart TV complete with controller. The new Archos TV Connect systems easily adds Google’s latest Android 4.1 Jelly Bean operating system to your HDTV system and is Google certifies providing full access to Google’s Play Store and more. Archos has equipped with TV Connect with a 1.5 GHz multi-core TI OMAP 4470 processor supported by 1GB of RAM, and 8GB of storage, and has been designed to be clipped on to the top of your HDTV.Its equipped with an Ethernet port, mini HDMI output, micro USB port, micro SD slot, HD webcam and a LED notification system, designed to provide notification of incoming calls from Skype and Google Talk apps. 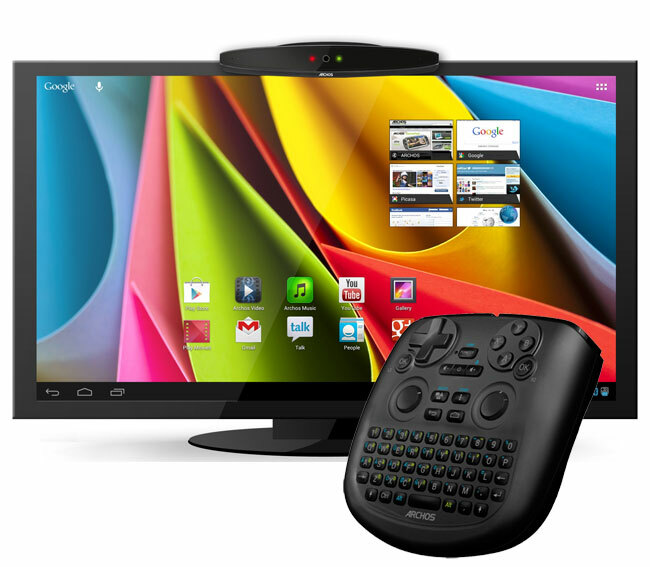 The Archos TV Connect system remote controller provides users with a full keyboard, and gamepad, together with Android shortcut keys, including a key for voice controls and voice typing. The Archos TV Connect will be arriving in stores next month priced at $129 or £99, and supports wireless connectivity if preferred.